Nevus sebaceus of Jadassohn is a congenital cutaneous hamartoma comprising of multiple skin structures. It has the potential to develop into variety of neoplasms of various epidermal adnexal origins. While multiple tumors may occasionally arise, it is unusual to develop two different types of tumor, benign and malignant, to arise simultaneously within a single sebaceus nevus. Here in, we report a case of a 27-year-old male with two neoplastic proliferations including a syringocystadenoma papilliferum a benign tumor and basal cell carcinoma a malignant tumor arising in a long-standing nevus sebaceus on the face. Neoplastic changes are common in nevus sebaceous present on scalp but our case is unique due to the presence of two different types of neoplasm in a nevus sebaceous which was present on face. 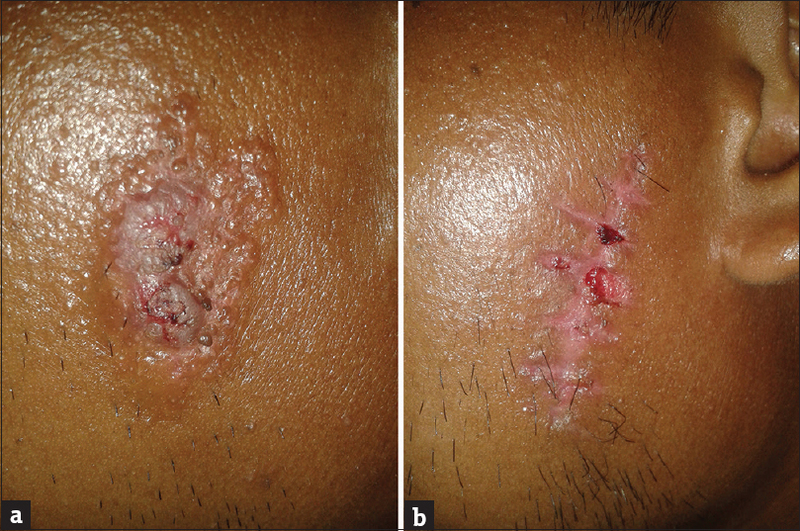 Sebaceous nevi are uncommon congenital skin lesions with a well-recognized potential for neoplastic change. Nevus sebaceous is uncommon hamartomatous lesions occurring in 0.3% of neonates. They were first described by Jadassohn in 1895 and are most commonly seen on the head and neck whilst similar lesions elsewhere on the body are termed verrucous epidermal nevi. , Usually recognized at birth or in early childhood, sebaceous nevi remain small and hairless until puberty when they may become larger and verrucous. In late adult life they have a well-documented neoplastic potential. Such changes are rarely seen in childhood. We report a patient with nevus sebaceous with one benign and one malignant tumor simultaneously occurring in a single lesion- syringocystadenoma papilliferum and basal cell carcinoma on face. A 27-year-old male came to the department of dermatology with a lesion on the left cheek that had been present since birth. In the preceding 2 months he had noticed a change in the lesion. On close inspection he had a linear lesion on the left cheek that measured 5 cm in length with a maximum width of 3 cm. This was a well-defined brownish, plaque with a rough surface [Figure 1]. Past medical history and general physical examination were unremarkable. Under local infiltration of xylocain 2% with adrenalin the lesion was excised as an ellipse with a 2 mm clearance margin and the wound closed primarily. Sections were stained with hematoxylin and eosin and examined with a light microscope. On histology epidermis revealed hyperkeratosis, hyperplasia, mild koilocytosis, papillomatosis and focal invagination in dermis lined by squamous cells. Dermis revealed mature sebaceous glands, few hair follicles and sweat glands. The invaginating epidermis into the dermis forms a cyst with numerous papillary projections [Figure 2]. The cross sections of these papillae were lined by two layers-a luminal columnar epithelium with evidence of decapitation secretions and outer flattened cuboidal epithelium. Abundant plasma cells were present in the stromal core of papillae. Careful examination showed a cluster of basaloid cells with peripheral pallisading of lesional cell nuclei [Figure 3]. Brownish pigment melanin was also seen in few of these basaloid cells. On the basis of these pathological findings a diagnosis of nevus sebaceous with foci of basal cell carcinoma and syringocystadenoma papilliferum was made. In 1965, Mehregan and Pinkus described the natural history of the lesion in three stages. In the infantile stage, the lesion presents as a characteristic quiescent yellow plaque. Histologically, there is a paucity of underdeveloped sebaceous glands and hair follicles. At the pubertal stage, growth of the lesion is accelerated and it becomes verrucous. Light microscopy shows masses of hypertrophic sebaceous glands with papillomatosis and hyperkeratosis of the overlying epidermis. In our case the lesion was excised as an ellipse with a 2 mm clear margin and primary closer was done. The patient was advised to come for regular follow up at 1 month interval. Special thanks to Dr. Rashmi Gupta, consultant. Alper J, Holmes L. The Incidence and significance of birthmarks in a cohort of 4641 new-borns. Pediatr Dermatol 1983;1:58-66. Jadassohn J. Bemerkungen zur Histologie der systematisirten Naevi und ueber 'Talgdruesen-naevi'. Arch Dermatol Symp 1895;33:355. Rook A. Naevi and other developmental defects. In: Rook A, Ebling FJG, Wilkinson OS, eds. Textbook of Dermatology. 4 th ed. London: Blackwell Scientific Publications; 1986. p. 174-6. Solomon L, Fretzin D, Dewald R. The epidermal naevus syndrome. Arch Dermatol 1968;97:273-85. Wilson-Jones E, Heyl T. Naevus sebaceous - a report of 140 cases. Br J Dermatol 1970;82:99-117. Mehregan A, Pinkus H. Life history of organised nevi. Arch Dermatol 1965;91:574-88. Chun K, Vazquez M, Sanchez JL. Naevus sebaceous: Clinical outcome and consideration for prophylactic excision. Int J Dermatol 1995;34:538-41. Piansay-Soriano EF, Pineda VB, Jimenez RI, Mungcal VC. Basal cell carcinoma and infundibuloma arising in separate sebaceous naevi in childhood. J Dermatol Surg Oncol 1989;15:1283-6. Sasson M, Mallory SB. Malignant primary skin tumours in children. Current Opinion in Paediatrics 1996;8:372-7. Lever W, Schaumburg G. Tumours of the epidermal appendages. In: Lever W, Schaumburg G, editors. Histopathology of the skin, 7 th ed. Philadelphia: Lippincott; 1990. p. 594-6. Castilla EA, Bergfeld WF, Ormsby A. Trichilemmoma and syringocystadenoma papilliferum arising in nevus sebaceous. Pathology 2002;34:196-7. 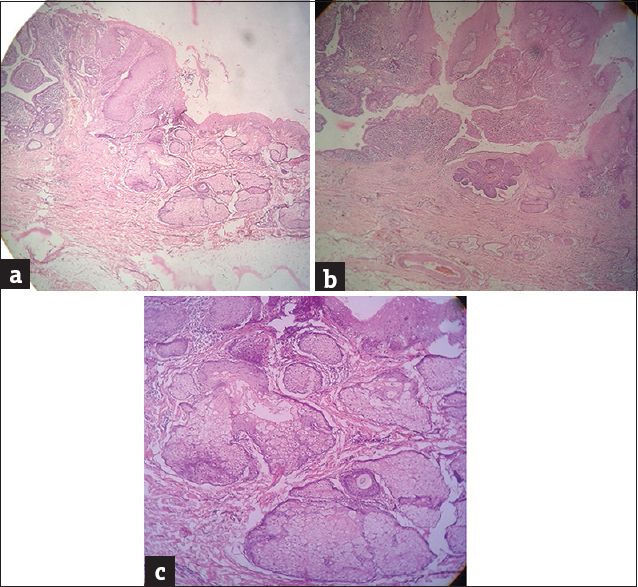 Cribier B, Scrivener Y, Grosshans E. Tumours arising in nevus sebaceous: A study of 596 cases. J Am Acad Dermatol 2000;2:263-8. Goldstein GD Whitaker DC, Argenyi Z, Bardach J. Basal cell carcinoma arising in a sebaceous naevus during childhood. J Am Acad Dermatol 1988;18:429-40. Sebaceous nevi can change into tumor in a lifetime but appearance of two different type of tumor like one benign and one malignant tumor in a single nevus is rarest of one. Surgical excision of nevus with a safe margin should be done in all cases of sebaceous nevi.